HarperCollins Publishers has announced it will be publishing a sequel to Michael Crichton's The Andromeda Strain. Crichton's science fiction disease thriller has inspired films and a TV series. The disease thriller has also become a subgenre thanks to Crichton's engaging thriller. The sequel, The Andromeda Evolution, will be published on November 12, 2019. Michael Crichton - who passed away in 2008 - did not write the new sequel. The Andromeda Evolution is a collaboration between CrichtonSun LLC and bestselling author Daniel H. Wilson. It will be published on the 50th anniversary of the original thriller. Harper President & Publisher Jonathan Burnham says in a statement, "It’s hard to believe that half a century has passed since the publication of The Andromeda Stain, particularly as the fears at the book’s core remain in the forefront of our collective consciousness; the title itself has become part of our culture – a shorthand for any global pandemic. Harper could not be more excited to publish the continuation to the book that launched Michael Crichton's career." Sherri Crichton, CEO, CrichtonSun LLC, says, "Michael’s first benchmark novel, The Andromeda Strain, was ahead of its time in both subject matter and how it was presented to the reader. It's exciting to be shining a spotlight on the world that Michael so brilliantly created and to collaborate with Daniel Wilson. This novel is for Crichton fans; it’s a celebration of Michael’s universe and a way to introduce him to new generations, and to those discovering his worlds for the first time." Author Daniel Wilson says, "As a lifelong fan of Michael Crichton, it's been an unbelievable honor to revisit the iconic world that he created and to continue this adventure. 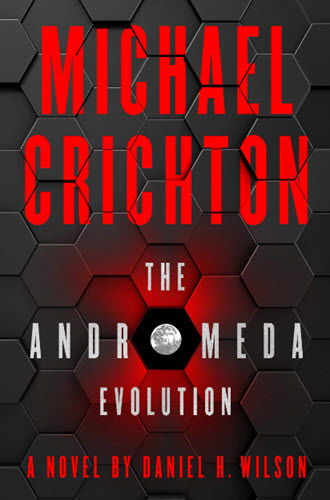 It's a testament to Crichton’s genius that the originality of The Andromeda Strain is just as exciting and relatable now as it was on the day it was first published."